The composite PMI readings largely lost ground in March, however, not by much in most cases. Italy Spain and China are exceptions where the composite PMIs gained traction. 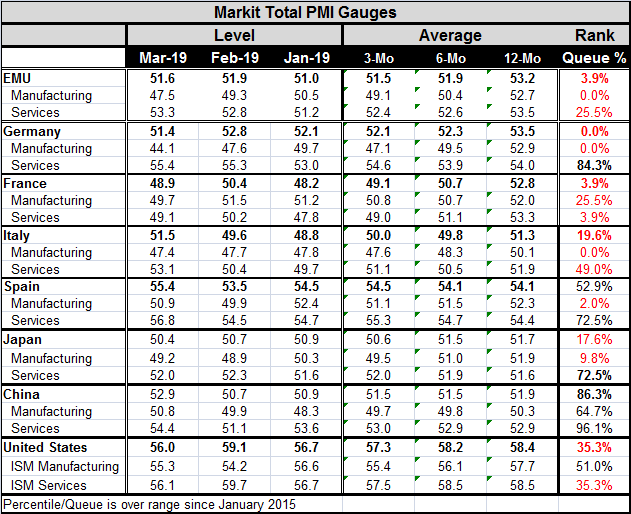 In four of eight of the countries/regions whose results are presented in this table, the service sector PMIs improved month-to-month and helped to cushion the impact of the ongoing weakness in the manufacturing sector. Manufacturing slipped month-to-month in the EMU and in its three largest economies. Elsewhere manufacturing improved month-to-month. Japan is the odd case in which the manufacturing PMI improved month-to-month to 49.2, but the index remains below 50 indicating ongoing manufacturing contraction. Manufacturing is contracting in March in Japan, Italy, France, Germany, and the EMU. In the U.S., the ISM survey data show some improvement in manufacturing, but that compares against a large step down for nonmanufacturing. As of March, only two of the eight composite PMIs in this table have readings above their respective medians measured since January 2015. They are Spain and China. Service sectors have readings above their medians calculated since 2015 in Germany, Spain, Japan, and China. However, the composite standing is weighed down by extremely weak queue standings in manufacturing, a zero percentile standing for all of EMU, a 9.8 percentile standing for Japan, a 51.0 percentile standing in the U.S. and a 64.7 percentile standing in China. The relatively firm standing for China associates with a weak raw diffusion reading of 50.8 in manufacturing. That confluence underscores how weak China's manufacturing has been that a diffusion reading of below 51 could have a queue percentile standing above the 60 percentile level. The PMI story has not changed by much for March. Manufacturing that has been weak continues to weaken further and that is a concern with five of eight readings already below 50. That development is balanced and mitigated to some extent by the month's improvement in services. Still, there is little true strength anywhere. While the U.S. posts the highest raw diffusion indexes in general in all categories (except for services/nonmanufacturing where the Spanish services sector tops the U.S. reading), the U.S. percentile standings are not high and in the case of nonmanufacturing momentum have turned dramatically weaker for March. Still, economic trends are complicated. Europe and the U.K. are still marked by differences over Brexit that have pushed the process so far past the expected limits that both sides are showing impatience and frustration. In the case of the U.K., there is frustration across just about any political factions you can name. In the EMU in February, retail sales firmed and Irish unemployment declined. The PMIs do not define the situation completely, but they are a good guide to what the sectors are doing and how they stack up versus past behavior. Generally, the more traditional economic reports are in line with the weak PMI readings. Brexit seems to be in its end game unless someone pulls a rabbit out of a hat. Parliament failed again to create a deal on its own when put in charge. Theresa May is now trying to cut a deal with Labor. Europe is losing patience and looking quizzically at the U.K. as it asserts that there is only one deal on the table and either it is approved or there will be a hard Brexit. Yet, Theresa May soldiers on... So that is another factor overhanging the weaker readings in Europe and in the U.K. with consequences that are unknown for the direct participants as well as for everyone else.